Although my takes on the players in the next series of posts might be useful to fantasy owners, this isn’t a fantasy football article. I’m not projecting stats. I’m writing about talented players whose portfolio of work reveals techniques and behaviors that I think translate well to the NFL game. At the end of the year, you might look at the stats and conclude that the quantity of the production wasn’t eye-catching for each of these emerging talents. However, I believe their work will be impressive enough for opposing teams, fans, and more astute fantasy owners to take future notice. Mike Williams technically “emerged” last year when he finally arrived at an NFL facility in football shape. He ascended from camp long shot to starting receiver and in 13 starts he accumulated 68 receptions, 751 yards, and 2 scores. Not bad for a guy who hadn’t played competitive football for two seasons. Fortunately, Williams’ offseason workout regimen demonstrates that he has figured out what it takes to become a professional football player. At age 27, Williams could produce at a high level for another 7-8 years if he maintains this new-found work ethic. Considering the Seahawks lacked a quality veteran receiver with a strong, multifaceted game to start opposite Williams in 2010, I believe last year was a promising sign for things to come. The first 1:40 of this video is a visual summary of Williams’ resuscitation of a nearly-derailed career. 1:55 – At 6’5″, Williams has an inherent advantage in the red zone with routes like the corner fade. Although he only caught two touchdowns last year, this corner fade demonstrates the potential for more production from this route. Williams adjusts his body extremely well on this play, plucking the ball at its highest point while turning his back away from the coverage to shield ball from the defender. The receiver shows good awareness of the sideline, coming down with both feet in bounds. This should be the type of route that the Seahawks will use more often to target Williams in 2011. The most important factor that will contribute to the future success of this route will be the quarterback play. If the Seahawks acquire a veteran passer that can establish a strong rapport with Williams, the big target has a chance to score double-digit touchdowns with half of them coming from the corner fade. 1:54 – Williams was in good enough condition to consistently run a solid short route with a sharp break. This hook route that catches the Titans cornerback off guard is a good example.Williams will never have blazing speed, but year after year we see receivers with blazing speed who fail to do anything in the NFL. Physically, Williams is a similar player to Keyshawn Johnson; a big, quick, and physical receiver capable of working the intermediate zones of the field when paired with a smart, accurate quarterback capable of throwing him open. 2:10 – Note the quick, first step after the catch that gets Williams into the open field after the catch. It’s realistic to expect Williams to gain a little more speed and quickness between last season and 2011 because he has made a commitment to stay in shape. It won’t be enough for him to get behind top cornerbacks in signal coverage on vertical routes, but it will make him a threat to reach the end zone from 25-35 yards out. 2:23 – Williams catches this dig route for a nice gain, but it is his release off the line of scrimmage that is impressive. For a big man, he does a great job of dipping his outside shoulder under the jam to get on top of the cornerback early in the route. This sets up a nice break to the inside. This type quickness and flexibility is not expected from a larger receiver. I continue to pick on rookie Austin Pettis, but he’s not nearly as big as Mike Williams and he demonstrated a lot of difficulty getting his pads under a press corner in Senior Bowl practices. So much so, the Bengals coach conducting the drill told Pettis that he never thought the receiver would be able to execute this kind of technique and Pettis better become a more physical player at the line of scrimmage. 2:33 – Williams faced Stanford Routt, one of the faster cornerbacks in the league, on this intermediate sideline fade. The Seahawk receiver maintains good position on the route and shows enough acceleration late in the pattern to explode to the ball. Although he could have waited maybe a beat longer, Williams extended his hands away from his body late in the route to maximize his speed and limit the defender’s opportunity to contest the reception. What I like most about Williams’ performance on this route is his strength to secure the ball despite the cornerback attempting to rip it free. Williams’ strength combined with his ability to extend his arms and adjust to the ball with a wide catch radius away from his body is what makes him the type of receiver that an accurate quarterback will feel confident targeting in tight coverage almost anywhere on the field. If Seattle gets this type of quarterback, Williams could become a 100-catch receiver. 2:39 – This is the same route as we saw the play before. Williams once again demonstrates acceleration late in the route, a strong skill to win the ball at its highest point, and the strength and catch radius to make the play. This throw was all about trusting the receiver to win the ball. 2:45-3:10 – These plays against the Cardinals are routes where Williams either has to make a quick break or work back to the quarterback to make the catch. Williams uses his strength and quickness to make these plays. With better conditioning, Williams should be very difficult for opposing defenses to cover because he should have an easier time working his way open throughout a contest. 3:15 – I have little doubt that Williams hands are some of the best pair in the league. The reason he dropped so many passes when he bounced around from the Lions, Raiders, and Titans is that he was out of shape. When a player’s stamina is gone his technique and concentration go with it. Now that Williams has regained some stamina, highlight catches like this one-handed palm of a pass at head level with defenders tight to him might happen with greater frequency. 3:24 – Quickness and flexibility for a big man. I said this earlier, but these two physical skills also show up with this nice double move against the Saints cornerback in off man coverage. Williams’ ability to bend and sell the break with his shoulders forces the cornerback to bite. The receiver catches the ball with at least a yard and a half on the corner and turns this play into a 68-yard reception – Williams’ longest play in 2010. 3:57 – Further evidence of good stamina aiding technique and concentration is this over the shoulder catch between two defenders for a touchdown. Matt Hasselbeck has to have an abundant level of confidence in Williams to make this kind of throw. 4:07 – Strength, strength, strength. Williams gets his hands into the pads of the defensive back, manhandles the defender off the line, and makes a quick turn outside. Williams gets his head around immediately and scores. This is another route where the Seahawks should expect a healthy percentage of touchdowns from Williams in 2011. Williams could become a pro bowl receiver if he’s paired with a veteran quarterback with Hasselbeck’s confidence to throw receivers open on intermediate routes in tight coverage. If Seattle opts for a young quarterback, Williams still has the skills to improve upon his 68-catch season because his size-strength combination makes him a safety blanket for a less experienced signal caller. If you have a chance to watch Williams’ performance against the Arizona Cardinals in Seattle, you’ll see a receiver converting targets where the defense knows he’s getting the football. When a receiver can win in that kind of situation, he has true play maker potential. Last year for Mike Williams was a confidence-building season for him, his quarterback, and his coaches. This year, Williams should take his game to another level of consistency. Increased production should follow. I’m not in the habit of wishing players ill. But this Lions’ fan is willing to make an exception for Mike Williams. Ha! You know, I used to feel that way about John Elway as a kid. There is something to be said about wishing someone well for his new-found maturity even if it meant letting go of the harm it caused to your best interests. However, I wouldn’t have wanted someone to tell me that about Elway several years ago, either. 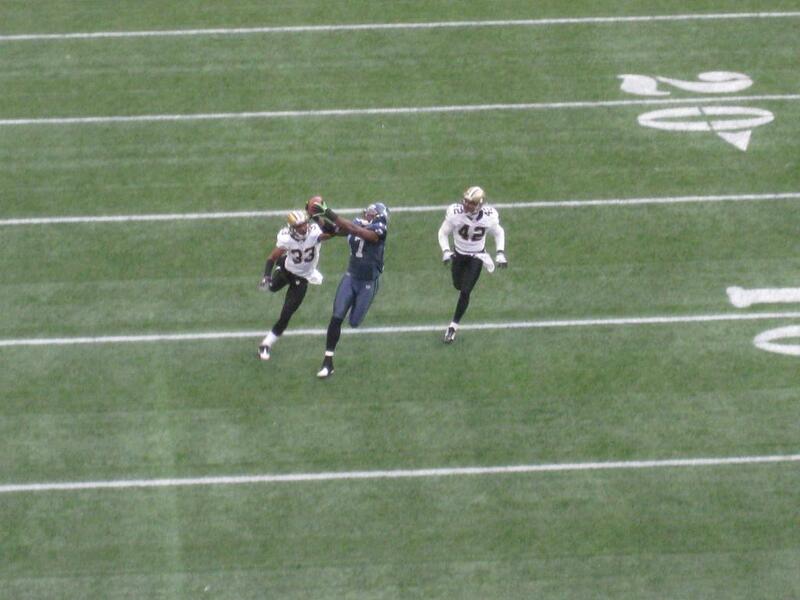 Between Williams and Golden Tate, Seattle has a couple of tough jump ball receivers to lean on. I think it’s imperative that they keep Hasselbeck around; Whitehurst did not shine last year, and bringing in a different vet (for more $ than Hass, probably) means teaching him the system in a shortened offseason.